After living in Bermuda for six years and riding a scooter everyday, I understand the need for a good quality raincoat. There were days when I got caught in a sudden rainstorm on my bike whilst on my way to work and within a few minutes was soaked straight through to my underwear. Having a spare set of clothes at work was a good idea. I actually quite like getting rained on when living in a sub-tropical climate, it can be somewhat refreshing at times. Not such a good look at work looking like a drowned rat though. However, my last raincoat had lost is waterproof coating after years of use and I needed a new one. I've noticed a big improvement in the stylish designs of raincoats since I have returned to Europe and wanted to find a minimalistic but fashionable coat which was eco-friendly in both material and brand ethics. 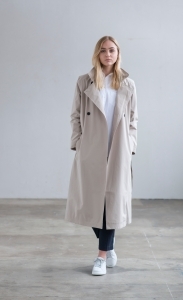 In my search I discovered Scandinavian Edition and their simple but stylish designs for both men and women and who produce both Winter and Summer raincoats not just 'bog standard' ones for all year round. Scandinavian Edition aim to make functional raincoats for everyone, that are also great value for money. Dedicated work and research has been put into the details – so that you to feel and appreciate the difference, the moment you start wearing a Scandinavian Edition product. They designed their waterproof, seam-sealed, insulated shell jackets to give people living in cold urban environments an alternative to the traditional coat – a perfect mix between refined style and practical function. Add a mid-layer like their Thinline insulation jacket to create an extra barrier against the cold. They work with high quality insulation brands to give you a warm, durable and eco-friendly synthetic insulation. The result is a product that not only keeps you warm but has a great freedom of movement and the unique feeling of being well dressed. They also have taped seams, which are heat sealed seams that stop water from seeping through the stitches. This is especially functional if you wear your jacket in heavy, prolonged rain. Their duo-layer membrane design and taped jackets offer protection from wind in the most severe conditions, while still being permeable from the inside to allow for breathability. Use one of their thermal layers for added comfort when conditions are cold. Scandinavian Edition continuously strive to offer a range of clean “city look” jackets and coats with superior technical quality – at a competitive price point. Their jackets can be worn more causally, or with a suit for work – a great alternative to the traditional coat or parka. The jackets and coats have a very diverse customer base and are created to blend in with your personal style. Luckily this week we have finally received some much needed rain in Amsterdam and I got to test my new coat out! I went with the trench coat style in Olive green which compliments my colouring well. As its long, it covers most of my body and comes with a hood in a zipped compartment around the neck. Perfect for if you cycle around the city and are unable to hold an umbrella (but some do have this talent which always makes me smile). It's lightweight and perfect for this time of year when it's not cold but you want to keep dry without sweating in your raincoat. It also looks stylish, so fine for wearing even when it's not raining (but you think it might later). Have a check out of their other women's and men's coats HERE or browse their Instagram account HERE. So, I'm of to enjoy some of this much needed rain in my Scandinavian Edition raincoat, the grass in the Westerpark was looking dead and brown a few days ago, so hopefully it will perk up a bit soon! I also hope the heat wave is over for this year...I've certainly had enough.